When economists say that we have far larger mineral resources today than ever before, they are usually referring to a model known as the resource pyramid. What they often fail to mention is that cheap, abundant energy is the key input into this model and that without it much of our presumed abundance would vanish. In the classic 1954 book "The Challenge of Man's Future" famed geochemist Harrison Brown posited a future in which there would no longer be mines, only processing facilities. With all the concentrated deposits of metallic and nonmetallic ores and helium (which is found in natural gas reservoirs) depleted, the only minable resources left for society's needs would be rock, air and seawater. But, together they contain everything we need other than land-based food and fiber for modern civilization. For example, granite contains many common metals such aluminum, iron, magnesium, titanium and manganese. Many more minerals including uranium are available in quantities of parts per million. Seawater contains most of the elements on the periodic table, the source of which is the erosion produced by streams and rivers feeding the oceans. The air contains rare "noble" gases that are important to industrial civilization including argon, neon, helium, krypton and xenon. The vast majority of the resources from rock, air and seawater, however, are at very low levels of concentration which is why granite and seawater are not currently being processed for their resource content (with the sole exception of salt from seawater). On the other hand, air is presently the only practical source for all the noble gases mentioned above except helium. These gases tend to be quite expensive since the processes for extracting them from air are very energy intensive. Brown's depiction is of a world at the bottom of the so-called resource pyramid. Economists use the resource pyramid model to explain why they believe humans will never run out of resources. If prices are high enough for a given resource, companies will have the incentive to develop previously uneconomic deposits, find a substitute for the high-cost resource, recycle and/or learn to do with less until a substitute can be found or new technology allows us to exploit resources that were previously technically impossible to extract. As we move down the resource pyramid, there is a lot more of any given resource to be had in the form of lower-grade deposits. The trick, of course, is to figure out how to extract these deposits economically. One of the key challenges for the future will be to obtain the needed energy to extract ultra-low-grade resources. Even in 1954 it was obvious that fossil fuels were finite and that someday modern society would have to run on other forms of energy. Brown could see only two alternatives, solar and nuclear power, which he was confident could provide the necessary energy to fuel the rock, air and seawater economy. What Brown feared was that we would not build up these two alternative energy sources fast enough to replace fossil fuels as their availability declined. This problem is now often referred to as the rate-of-conversion problem. 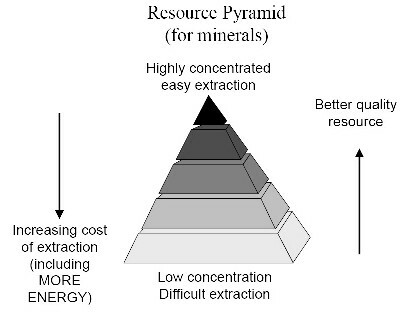 Brown's depiction of a possible future mineral economy clearly illustrates that energy availability is the Achilles heel of the resource pyramid. Even arch cornucopian Julian Simon acknowledged that energy is the "master resource." Simon, who died in 1998, was certain that human ingenuity would provide a steadily increasing supply of energy needed to obtain all other resources. If he's right, we need only sit back and let the magic of the market provide us with the energy of the future. But, here's why the future may not work out as Simon and other cornucopians envision. The main energy resources we use today are mineral resources. Oil, natural gas, and coal provide 86 percent of the world's energy. All of these resources are thought to be growing more abundant through the magic of the resource pyramid. But, if you examine the pyramid closely, you will see that not only do low-grade fossil fuel resources require better technology to extract them, they also require increasing amounts of energy to run that technology. At some point the amount of energy needed to bring low-grade deposits of oil, natural gas and coal to the surface and process and transport them will be more than the energy we get from these resources. At that point they will cease to be energy sources, and the vast, remaining ultra-low-grade deposits of these fuels will be useless to us except perhaps as feedstocks for chemicals. If this happens to fossil fuel production too soon, it will also mean that we will have severe restrictions on the amount of energy available to extract other minerals from the ground and rare gases from the air. In practice problems related to energy supply and mineral extraction will show up long before we reach the point where it takes more energy to get fossil fuels than they yield. If the peak rate of production for oil is near and peak rates for natural gas and coal are not too far behind, then the total energy available to world society could begin to decline making resource extraction of all types progressively more expensive and difficult. One way out of this dilemma is to move away from fossil fuels to renewable energy and nuclear power. But, nuclear power expansion has proceeded at a snail's pace since the accident at the Three Mile Island reactor in 1979. Renewable energy is now growing at a high rate; but it makes up such a small sliver of the overall energy pie that even its current fast pace of development implies decades before renewables become a major power source. After fossil fuels begin to decline, we will find ourselves in serious trouble unless alternatives are being deployed at a rate that will make up for that decline. Without a transition to vast new supplies of nuclear and renewable energy, the promise that we will be able to go all the way to the bottom of the resource pyramid is a mere daydream. The resource pyramid only shows what is possible. It does not guarantee that humans will achieve it. If peaks in fossil fuel production are nearing, either society will have to learn to get along without many of its critical resources, or it will have to make the transition to alternative energy swiftly as part of an engineering and planning feat that would be unparalleled in human history. Great article. In effect this is in a very similar vein to King Hubbert's linearisation as used for peak oil and latterly peak coal and phosphorous. With energy use we are screwed, we won't be able to dig up fossil fuels once they've been burnt. The horrifying calculation about energy use is that of how many energy slaves we require. Assume you live in a flat place. Put a gallon of gas in your car. Drive as far away as you can. When you run out, hire some people to push you back by hand. How much will it cost you compared to the gas? It can be shown that in the developed and increasingly in the developing world, that in-effect, in the UK, each man woman and child has the equivalent of around 110 'energy slaves'. It can be shown that in the developed and increasingly in the developing world, that in-effect, in the UK, each man woman and child has the equivalent of around 110 'energy slaves' . In the US they have 200 energy slaves. A fit adult male in the prime of life can produce 100 Watts for prolonged periods. The average UK citizen in 2005 used energy at the rate of 5.5 kW 24 hours per day, 7 days per week. These 'slaves' 'fetch' the energy that permits us to live as we do. If it weren't for these energy slaves obeying our wishes at the flick of a switch or the press of an accelerator pedal, then everything done by them would need to be done by a human being. For those who cannot afford such an army of servants [and since it is utterly impossible for one person to do the work of one hundred and ten people, or for every man woman and child in the UK to have all these slaves], most of this work clearly couldn't be done at all. Clearly without this low-cost energy, life just wouldn't be the same and we would all be rapidly returned to something resembling seventeenth century [pre fossil-fuel] drudgery! This would have severe implications for scientific and technological research and progress, because only the super-rich with time on their hands would have any time for 'contemplation'. It seems quite possible that the rest of us would have every single waking hour of our short miserable lives filled by ceaseless toil, in order to feed ourselves and our families. As for modern high-tech industry, that would seem to be effectively ended in such an energy starved world. The (surviving) national workforce would be forced to return to low-paid manual labour and agriculture, within walking or cycling distance of home. All practices and processes that are wasteful and energy intensive, will be a thing of the past. Unnecessary high speed, long distance commuting and transport of goods will come to an end, additionally the transport infrastructure will be impossible to construct or maintain. Cars with fossil fuelled internal combustion engines will become a thing of the past. Things are going to change a lot, unless we move away from fossil fuels before they start running out. We urgently need: Gen IV fast reactors; upgraded electricity grid; electricity storage; renewables; extreme energy efficiency; population reduction. The situation is actually more serious. Here's why. The rate of conversion problem is real, but there is still a flaw in the reasoning. It assumes that if we make the transition soon enough, all will be well. In reality, even if we build a vast renewable energy infrastructure and lots of nuclear power plants, they don't last forever. They need maintenance and eventually end their useful service lives. Their maintenance and replacement still require fossil fuels. Renewables cannot bootstrap themselves because renewable-energy infrastructure and the plant and equipment for nuclear power are industrial products. The whole chain of industrial products from mining, refining, blast furnaces to produce pig iron, processing into steel, the production and processing of nonferrous metals, the founding and processing of machine parts, and what have you would be impossible without fossil fuels. Leave Coal Buried paints a grim picture of the future. I can't rule it out, but I think humans will not stand still, but will attempt with all their power to ameliorate the difficulties which Leave Coal Buried rightly outlines. In fact, important steps are suggested at the end of the comment. Rice Farmer is right to be concerned about the rate-of-conversion problem. But it is conceivable that an industrial economy could be maintained using renewable and nuclear energy. I think such an economy would be far smaller than today's economy. And, I'm assuming we will make the conversion successfully before key systems fail altogether. Modern civilization is hostage of oil industry which tasted $147/bbl and wants nothing more. Therefore we will have resource shortage anyway. Peak Oil can be mitigated with new exploration technology which provides a threefold increase in oil field discoveries. Industry does not interest in progress in discoveries. Curt, I can't say you're wrong, as I have done no calculations. I'm just approaching this from a common-sense perspective. Remember that to maintain industrial civilization, even at a lower level, its energy system must not only be self-sustaining, but also yield a considerable energy surplus. Fossil fuels got us this far because their concentrated energy sustains the system itself and yields a huge energy surplus to drive industries. Take a wind turbine, for example. It will generate a certain amount of electricity during its useful lifetime. For this energy system to be self-sustaining, it must (1) pay for its initial energy investment, (2) additionally produce enough energy to manufacture and deploy another wind turbine to replace itself, and (3) additionally produce an energy surplus that would supply an appreciable number of homes and business with power -- which is the whole reason for its existence. And don't forget the construction and maintenance of wind farm access roads, mobile cranes, and the like. Again, I have done no calculations, but can the turbine produce enough energy to do all that? And equally important, can electricity be used to run a blast furnace, forge steel, found machine parts, and do all the other things that coal and oil now do for us? The same goes for nuclear power. So, advocates need to show that renewables can meet these requirements before they start promising the public that we can have our cake and eat it, too.